This March, Keep the Tennessee River Beautiful (KTNRB) will launch the “Tennessee River Grand Slam Cleanup,” bringing four major cleanups spanning 400-plus river miles in four weeks. The cleanups will offer a timely service following severe flooding that occurred in the wettest February ever recorded for the Tennessee Valley. States of emergency were declared for Tennessee, Alabama, Mississippi, and Kentucky. Though the river is expected to have receded, it will leave behind debris where flood waters temporarily occupied higher grounds. KTNRB will work with volunteers to document the types of litter collected, as the cleanups are also taking place one month after German scientist Dr. Andreas Fath released his findings that the Tennessee River was one of the most plastic littered rivers in the world. In 2017, Fath swam the 652-mile river, collecting samples that returned high levels of microplastics. The Grand Slam Cleanup campaign will receive reinforcement from Living Lands & Waters, a national nonprofit that has removed more than 10 million pounds of trash from American rivers. Chad Pregracke, Living Lands & Waters founder and 2013 CNN Hero of the Year, brings a crew that make the cleanups memorable and fun-filled for volunteers. LL&W will drive volunteers on plate boats to reach more remote shorelines for litter collection. This Tennessee River Grand Slam Cleanup is part of the Great American Cleanup®, a signature program of national nonprofit Keep America Beautiful®. Through this far-reaching effort, which takes place from March 20 through June 20, Keep America Beautiful’s national network of community-based affiliates host cleanups in more than 20,000 communities, engaging over 1.5 million volunteers and participants. Lowman and her team will join the cleanup in Iuka, MS on Friday, March 15, to officially kickoff the Great American Cleanup nationwide and to launch Keep America Beautiful’s new Common Ground Campaign. Local elected officials have been invited to each of the Tennessee River Grand Slam Cleanup events to demonstrate that the cleanliness of our communities—and by extension, our waterways—is Common Ground, a non-partisan issue. The hope is that this new initiative will serve as crucial, tangible steps for the nation moving forward. Keep the Tennessee River Beautiful is the first KAB affiliate in the nation to focus solely on a river, seeking to maintain the beauty and health of the Tennessee River watershed. The nonprofit is the brainchild of a collaboration between the Tennessee Valley Authority (TVA), Keep Tennessee Beautiful (KTnB), and Living Lands and Waters after the organizations co-sponsored a Tennessee River awareness campaign in 2015. 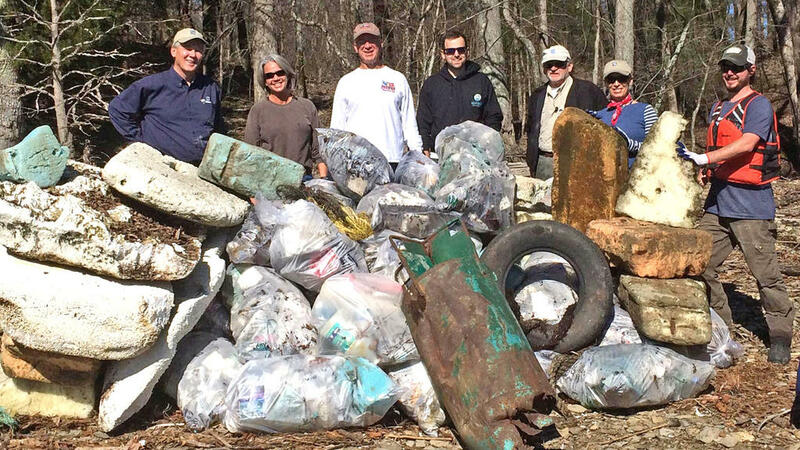 Thanks to support and partnership from TVA, KTnB, and the Tennessee Department of Transportation (TDOT), Keep the Tennessee River Beautiful has been able to rally 704 volunteers to remove 55,655 pounds of trash from regional waterways in just over two years. The upcoming cleanups are expected to significantly increase those statistics. Volunteers will need to wear long-sleeved shirts, pants, and shoes that can get muddy. All cleanup supplies will be provided. Each volunteer will receive a t-shirt and some other KTNRB swag. To register, visit www.KeepTNRiverBeautiful.org. Volunteers will receive free lunch at the Aqua Yacht Harbor Grille at noon and then hit the water for cleanup at 1 p.m. This unique location on the Tennessee River is a popular vacationing site and touches on the state borders for Tennessee, Mississippi, and Alabama. This event will serve as the official kickoff cleanup for the 2019 Great American Cleanup. This unique cleanup will impact four cities that meet at the Tennessee River in Alabama—including Florence, Muscle Shoals, Sheffield, and Tuscumbia — (a.k.a. “The Shoals”). Volunteers can clean the shoreline from Riverfront Park, located in front of the notable Cypress Moon Studios. Now a concert venue, recording and film production studio, it was once the location of the Muscle Shoals Sound Studio where Bob Dylan, the Commodores, Lynyrd Skynyrd, Melissa Etheridge, Jimmy Buffett, and other legends recorded. Living Lands & Waters will transport volunteers via boat from the park to other shorelines along The Shoals. Alternatively, volunteers can hop in a shuttle van to be taken to Living Lands & Waters boats working at a higher elevation on Wilson Lake, putting in at Fleet Harbor. After the cleanup, lunch will be provided back at Riverfront Park. Pre-registered volunteers will enjoy a free tour of Cypress Moon Studios! This effort is supporting Ijams Nature Center’s 30th annual Ijams River Rescue, which averages more than 800 volunteers each year. As part of the Ijams “Take Action” campaign, a Living Lands & Waters staff member will speak in the multi-purpose room in Ijams Nature Center at 7 p.m. on Friday, April 5. This annual Ijams cleanup was the kickoff event for the 2015 Tennessee River Tour, a campaign cleanup initiative that led to the forming of Keep the Tennessee River Beautiful, so KTNRB’s history runs deep with this one! This is a first-time cleanup site for Keep the Tennessee River Beautiful! The cleanup will take place two days prior to Major League Fishing’s prestigious Bass Pro Tour that will be aired on the Discovery Channel. Chickamauga Lake is a well-known fishing mecca, and MLF’s professional anglers reacted enthusiastically when this fishing site was announced on the Bass Pro Tour. Volunteers will be provided a free meal following the cleanup. To register for a Tennessee River Grand Slam Cleanup, visit www.KeepTNRiverBeautiful.org. The national sponsors of the Keep America Beautiful Great American Cleanup are Altria, Dow, The Glad Products Company and Niagara Bottling. Keep the Tennessee River Beautiful is the first Keep America Beautiful affiliate in the nation to focus solely on a river. They aim to rally communities along the river to preserve, improve and protect the river for generations to come. Keep America Beautiful, the nation’s leading community improvement nonprofit organization, inspires and educates people to take action every day to improve and beautify their community environment. Established in 1953, Keep America Beautiful strives to End Littering, Improve Recycling and Beautify America’s Communities. We believe everyone has a right to live in a clean, green and beautiful community, and shares a responsibility to contribute to that vision.